In the 1840s and ‘50s the German-born artist Godfrey Frankenstein (1820–1873) painted Niagara Falls over and over, from a hundred angles, under all seasonal conditions. His work verged on obsession. In nine years of observation, sketching, and painting, he produced more than two hundred studies, and his finished work, Frankenstein’s Panorama, consisted of approximately one hundred works on canvas. 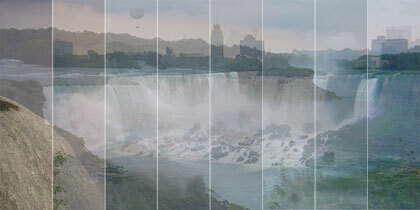 In the spirit of Frankenstein, we created a new panorama of Niagara Falls, a collage of recent images gleaned from photo-sharing websites. Many of the twenty million annual visitors to the falls, out of a desire to remember and share their experience of the thundering cascade, have documented the encounter in photographs, then uploaded the pictures to sites such as Flickr and Facebook. The resulting collective online archive rivals Frankenstein’s obsessive waterfall survey, and ranges from snapshot portraits to carefully composed images of the falls sparkling with ice, illuminated by night in rainbow hues, or alive with birds. These photos form a stunning tribute to the enduring enchantment and power of Niagara Falls. Alphabet City is a series of annual hardcover anthologies originating from Toronto, Canada. Each volume in the series addresses a one-word topic of global concern and draws on the diverse perspectives of writers and artists from many cultures and disciplines. Each book is a graphically rich and textually surprising combination of images and texts that critically and imaginatively reinvents the topic at hand.